200-lb. 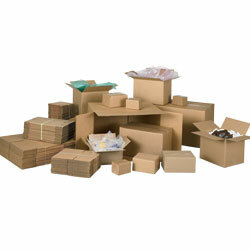 test, puncture-resistant corrugated boxes are approved for shipping via parcel post, truck, rails, express, and UPS. 100% biodegradable. All cartons meet or exceed the standards set forth in Section 222 of the National Motor Freight Classification. Boxes are unmarked so you can add your own labels and stamps. Ships flat to save UPS costs. IN STOCK. XP-0574 17	 25	 10" x 10" x 8"
XP-0585 18	 25	 12" x 10" x 7-5/8"
XP-0598 45	 25	 14" x 14" x 20"
XP-0599 25	 25	 14-1/2" x 8-3/4" x 12"
XP-0607 19	 25	 18" x 6" x 6"
XP-0619 58	 25	 23-1/2" x 23-1/2" x 12"